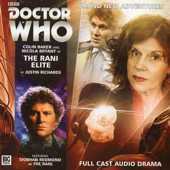 Appearances: "The Mark of the Rani", "State of Change", "Time and the Rani", "Something Borrowed", "Dimensions in Time", "The Rani Elite", "The Rani Reaps the Whirlwind", flashback scene in "Divided Loyalties", appeared briefly at the end of the Sixth Doctor novel "Spiral Scratch". Doctors: Third Doctor, Fifth Doctor; Sixth Doctor, Seventh Doctor, was a childhood friend of the First Doctor; trapped the First, Second and Fourth Doctors in a time tunnel. Companions: Liz Shaw, K9, 2nd Romana, Nyssa, Peri, Melanie Bush, Ace; indirectly encountered Susan, The Brigadier, Captain Mike Yates, Leela and Victoria as the time shifts she created drew them in without them ever meeting her face-to-face. History: Even back in her days in the Time Lord Academy, Ushas showed signs of instability. Possessing a passion for genetics, she created several bizarre lifeforms during her experiments, on one occasion accidentally killing the President's cat when overgrown mice she had created got away from her and ate the cat. Despite this, she was still a much-appreciated member of the Deca, a group consisting of her year's ten best students, whose members included the Time Lords who, in the future, would make a name for themselves in the universe - The Doctor, Koschei (The Master), Magnus (The War Chief ), and Mortimus (The Meddling Monk) (There are even some hints that she and The Doctor were involved at one point, although this remains nothing more than conjuncture at the present). However, eventually, Ushas grew tired of Gallifrey, feeling that the Time Lords would never forgive her for that minor incident of involving the cat and the genetically-augmented mice, and settled on the planet Miasamoria Goria, where she ruled for some time as their Rani, albeit under a tenuous patronage. Ushas - later adopting the name 'The Rani' on a permanent basis - was not the typical kind of evil Time Lord; her villainy didn't arise because she wanted power or something similar. She simply had a mindset that treats everything, including morality, as being secondary to her main experiment; she was even known to enslave entire planets simply to provide herself with somewhere to have a laboratory and a ready supply of test subjects. Although the people of Miasamoria Goria more than met these requirements, her experiments had an awkward side-effect; although her experiments on their metabolism had heightened their awareness, they now lacked the ability to sleep. To correct this defect, she came to Earth to extract a certain chemical from human brains, uncaring of the fact that this not only deprived the humans of the ability to sleep but also made them highly violent. She had conducted her operation at various points in human history, such as at the Trojan War, the Dark Ages and the American War of Independence without interference, but things went wrong when she targeted the Industrial Revolution, attracting the attention of two of her old 'friends' - The Doctor, now in his Sixth incarnation, and The Master, who stole a sample of her collected brain fluid to blackmail her into helping him kill The Doctor. With the aid of The Master, The Rani was able to send The Doctor hurtling down a mine after he discovered her presence in that era, but he was saved by George Stephenson, one of the pioneers of the Revolution. While searching for the ingredients for a sleeping draught to treat those who had fallen victim to The Rani’s experiments Peri, The Doctor's companion, nearly fell victim to a bomb of The Rani's that turned humans into trees (Her ‘defence’ being that the humans were better off as their life spans were now at least four times longer), but Stephenson's assistant, although now a tree himself, managed to protect her long enough for The Doctor to force The Rani to guide Peri out of the minefield. The Doctor than tricked The Master and The Rani into operating her sabotaged TARDIS, leaving them accelerating to the far reaches of the universe with no way to reach the console to reset the coordinates. However, The Master managed to escape by severing The Rani's console room from the rest of her TARDIS, typically uncaring of the fact that this left The Rani adrift in the Vortex. While trying to stabilise her orbit, The Rani came across a region of space-time where she encountered a single, benign entity with the ability to copy anything it observed in the outside Universe. She taught the entity to control its powers and ordered it to track down a TARDIS console and copy it for her - but the entity misunderstood her instructions, and when it attempted to copy The Doctor’s TARDIS console while The Doctor and Peri were visiting ancient Egypt to witness Cleopatra's coronation, it copied most of Europe and Africa as the TARDIS dematerialised. The resulting energy drain needed to successfully duplicate everything caused The Doctor, Peri and The Rani to become suspended in Time for several years, during which time the creature taught itself how to maintain its new world’s stability, and set ‘monsters’ in the void beyond the areas it had copied to prevent anyone from venturing too far... while, in Egypt, the Egyptians used the information they gathered from the duplicate TARDIS console to develop modern-day technology in a mere 25 years, while Cleopatra and Mark Antony's three children- Ptolemy Ceasar, Alexander Helios and Cleopatra Selene - became the triumvirate rulers of the new Dominion. When The Rani awoke, she took on Selene's identity to try and get access to the duplicate TARDIS console, while The Doctor and Peri found themselves in a TARDIS that lacked a power source, as the link to the Eye of Harmony had been severed, and their morphic prints were destabilised; until the stabilisers were reactivated, The Doctor found himself regressing through his past five incarnations as his body sought a stable point, and Peri was transformed into a bird-woman based on her memories of her traumatic transformation in "Vengenace on Varos". Exploring the new world, The Doctor, now with a stable morphic print, and Peri learned the truth about the situation... and that Alexander had replaced Cleopatra's body with a nuclear bomb to take 'Selene' out of the equation. Fortunately, Peri was able to drain off the bomb's power (As well as siphon energy from a nuclear power plant) to provide the TARDIS with an alternative power supply to the currently-lost Eye of Harmony - simultaneously recruiting Ptolmey Caesar as their ally in recognition of his superior abilities as a ruler - and then, in an encounter with 'Selene', The Doctor finally identified her as The Rani. He also realised that, due to morphic instability, The Rani had taken on many of Selene's mental characteristics, and now intended to conquer this alternate Dominion and use the people as slaves to further her own ambitions. Fortunately, The Doctor and Peri were able to help Ptolmey rally support - The Doctor, having been forced to fight in the games, gave the impression that he was Ptolmey’s man after winning his bout, while Peri used her bird-like appearance to pose as the ‘spirit of Rome’ to rally Ptolmey’s old allies - The Doctor later infiltrating The Rani’s TARDIS to make contact with the creature. Learning that the entity was basically benevolent, and that The Rani had only ever ordered it about and hadn't even bothered to name it, The Doctor was able to win its support when he called it Iam and talked to it as an equal. Linking Iam to the TARDIS, The Doctor taught it how to create a new planet in an unoccupied solar system in the real Universe, one to which it could transport itself and the entire Dominion and its people. After The Doctor freed Selene from The Rani's TARDIS, The Rani returned to normal, and, realising her plans had failed, connected the duplicate console up to her own ship and departed just as Iam took the Dominion to its new home, as well as reverting Peri to her normal, human state. Seeking a means to extend the natural regeneration limit, The Rani travelled to the planet Koturia, believing that the natives’ natural power of Phasing - transforming into new people during their marriage ceremonies - would allow her to modify her body’s own ability to regenerate ("Something Borrowed"). To accomplish this, The Rani was able to manipulate Jonos, an upper-level Koturian, to the point where he believed that she loved him, intending for Jonos to phase during the ceremony and allow her to study his DNA due to him having phased to be compatible with her. The Doctor and Peri were invited to the ceremony as The Doctor was an old friend of Jonos’s father, but The Doctor needed to do very little thanks to The Rani having overlooked the fact that Phasing would only occur during the ceremony if both parties were in love with each other, resulting in Jonos not phasing and The Rani departing with nothing to show for her efforts. Eventually, The Rani began her most elaborate scheme yet, gathering together some of the greatest minds in history on the planet Lakertya with the aid of her servants (A race called the Tetraps that resembled the offspring of bats and monkeys), intending to combine their intelligences into one massive brain. However, for her scheme to prove successful, she required a Time Lord brain - specifically, The Doctor's brain, due to his unique understanding of Time. She eventually found and drew in The Doctor and his new companion Mel, somehow (Through either luck or planning, which is unknown) targeting the Sixth Doctor just after he had sacrificed his current self's remaining chronal energy to stop a pan-dimensional being destroying creation, thus causing him to regenerate into his Seventh incarnation. Taking advantage of his natural confusion, The Rani injected him with a drug to increase his amnesia, then disguising herself as Mel to trick The Doctor into helping her repair her equipment. The Doctor eventually regained his memory and met up with Mel, but it wasn't in time to destroy The Rani's plans to connect him up to the brain; fortunately, The Doctor's character meant that he provoked the other geniuses by talking gibberish, and The Rani was forced to disconnect him. However, it had been long enough for The Doctor to deduce her plans; Lakertya was being orbited by an asteroid of Strange Matter, and she was using the Brain to create a formula lightweight substitute for Strange Matter, with which to detonate the asteroid and create a supernova. The force of the explosion, combined with the preparations she's made in her laboratory would transform Lakertya into a Time Manipulator, a planet-sized cerebral mass capable of rewriting the order of Creation and restructuring evolution to The Rani's order (She even intended to save the dinosaurs!). Fortunately, using the bombs planted by The Rani to keep the natives under control, The Doctor was able to destroy the brain and delay the countdown long enough that the missile that would have destroyed the asteroid missed its target. The Rani escaped Lakertya, but she was now the prisoner of the Tetraps, who took her back to their home planet to force her to use her intelligence to solve their resource shortages, although she was later able to escape by joining forces with the humans and aliens the Tetraps had collected for her to use as 'guinea pigs' in her experiments ("The Rani Reaps the Whirlwind"). Having recovered a TARDIS, The Rani moved on to her next scheme, resolving to deal with The Doctor once and for to punish him for his past defeats of her. To this end, she created a hole in time using the energies of a vast galactic menagerie of clones, simultaneously creating a computer with the genetic codes and brain prints of every living creature in the entire universe. The mental energy of this accumulation of alien minds allowed The Rani to cycle through The Doctor’s lives, causing him and his companions to randomly switch between his various incarnations while trapped in an area of London’s East End. Although The Rani managed to trap the first two Doctors in a time tunnel, the Fourth Doctor was able to send a warning to his remaining selves, the Third, Fifth, Sixth and Seventh Doctors subsequently rallying themselves to oppose The Rani’s scheme even as she unleashed members of her menagerie against them. Fortunately, The Rani’s scheme was undone when she attempted to capture one of The Doctor’s companions to serve as her human specimen, only to end up scanning Romana into her menagerie by accident. With two Time Lord brains now in her system, the Seventh Doctor was able to override The Rani’s control of her TARDIS by drawing on the power of his other selves, the subsequent link to the computer sending The Rani’s TARDIS into the time tunnel where she had intended to trap The Doctors, simultaneously freeing the first two Doctors from the tunnel. Having escaped the time tunnel, The Rani regenerated into a new body, this incarnation possessing shoulder-length red curls and a Scottish accent (It is unclear if the accent was 'influenced' by the Seventh Doctor or just a coincidence). Using this new disguise, she impersonated Professor Baxton at the College of Advanced Galactic Education, presenting herself as an authority of Moral Philosophy. While testing the College students, all already experts in their fields, The Rani set out to determine their suitability for her latest experiment to create a biodigital interface controller, as well as using the students' minds to calculate the minor events needed to arrange the massive events she wanted, essentially reverse-engineering chaos theory. To this end, she used a Sidelian Brain Scanner - a technology that hadn't been invented by this point in time - to move memories from one brain to another, with the real Professor Baxton acting as the overseer of the network. She also attempted to use this role to set a trap for The Doctor by inviting him to a ceremony where he would receive an honorary degree in moral philosophy, but this plan slightly backfired as she unintentionally drew in the Sixth Doctor rather than the Seventh. Despite the potential temporal risks, The Rani continued with her plan, using Peri as part of her experiments after one of the students suffered a concussion, but The Doctor was eventually able to thwart her scheme and The Rani was forced to flee, although she left him with a taunting reference to her role in his next regeneration. Although she was subsequently sent to Teuccaurora Penitentiary for her crimes, after 97 years The Rani managed to become the prison governor ("Planet of The Rani"), using the prisoners to establish a time corridor to Miasimia Goria. When The Doctor arrived - the Sixth Doctor now accompanied by new companion Constance Clarke after Constance discovered a message in The Doctor's e-mail about The Rani's parole hearing - The Rani took Constance Clarke through the corridor with her as a hostage. Arriving back on Miasimia Goria, The Rani was initially appalled at the state the planet was in, but was delighted that Raj Kahnu, a child with an accelerated intellect, had become a success, proclaiming him as the only one of her experiments to work correctly. With his lack of sleep making him hostile and his perception of The Rani as his mother making him loyal to her, Kahnu trapped Constance in one of the suits of armour he used to get around on a regular basis, but turned against his 'mother' when The Doctor was able to cure his insomnia. Although The Rani showed some emotion when she thought he was dead, this didn't stop her from trying to kill Kahnu when her subjects tried to put her on trial for her past actions, eventually escaping in a TARDIS survival pod that she had left there in her previous incarnation rather than let The Doctor take her back to Gallifrey. Whether The Rani survived the Time War between the Daleks and the Time Lords referred to by the Ninth Doctor in the latest series remains to be seen. Although the Ninth Doctor was convinced that he is the last of the Time Lords, the existence of the chameleon arch - a device capable of turning Time Lords into humans ("Human Nature/The Family of Blood") - and the discovery that The Master escaped the war by posing as Professor Yana ("Utopia") has opened up the possibility that The Rani escaped the war in a similar ‘disguise’, the most popular candidate for her human identity being The Master’s wife Lucy Saxon ("The Sound of Drums/Last of the Time Lords"). Following the recent revelation that the Doctors were able to save Gallifrey on the last day of the War by sending it to a parallel pocket universe ("The Day of The Doctor"), further possibilities for The Rani's survival have presented themselves, but it is still uncertain if she was on Gallifrey at the time and she may have died during the earlier stages of the War.